A drug company announced on Friday that eight lots of Irbesatan blood pressure medication have been recalled after testing showed the medication contained trace amounts of a cancer-causing material. 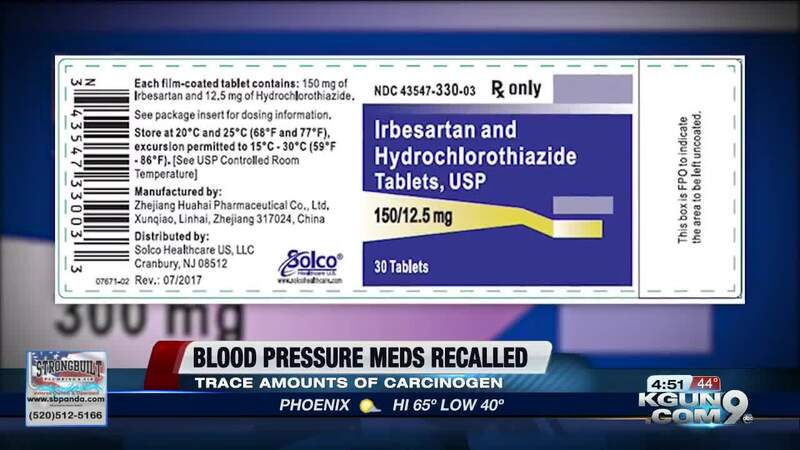 Specifically, one lot of Irbesartan tablets and seven lots of Irbesartan HCTZ tablets were recalled. Prinstin Pharmaceuticals said the medication contained unacceptable levels of Nitrosodiethylamine -- or NDEA-- a likely carcinogen. The ingredients were manufactured by Zheijiang Huahai Pharmaceuticals in China, a company which has been linked to several recalls of regularly-prescribed blood pressure drugs since July.